Summary: From the internationally bestselling author of Nefertiti and Cleopatra’s Daughter comes the breathtaking story of Queen Lakshmi—India’s Joan of Arc—who against all odds defied the mighty British invasion to defend her beloved kingdom. I should probably warn you that I love every Michelle Moran novel that I've read... and I've read all of them except for the ones she wrote as a teenager. It seems like forever since she's written a new book, but I'll cut her a break because she's been rather busy in her personal life getting married and having a baby! Her brand-spanking new novel REBEL QUEEN is released today, and I couldn't wait to share my thoughts with you. Of course, I enjoyed this novel and I read it in just a few sittings! REBEL QUEEN encompassed everything I've come to love about Ms. Moran's novels -- a strong female character, fascinating historical information, and a compelling story. This novel is most definitely entertaining... and I even learned a thing or two about the history of India. REBEL QUEEN tells the story of Queen Lakshmi, the queen of the Kingdom of Jhansi who fought against the British invasion in the mid 1800s to protect her kingdom. At the time, India was fairly divided and a relatively easy conquest for the mighty Brits. However, Queen Lakshmi raised two armies that seemed to be no competition for the British army; however, they were determined not to lose their empire. You might think that the author would have written this story through the eyes of Queen Lakshmi, but she made a very interesting decision to use one of the queen's trusted female soldiers, Sita. Sita grew up in a poor village and trained for years to be chosen as one of the queen's female protectors. After she left to move to Jhansi, she became very close to the queen and actually as one of her special advisors. She and the other women in the queen's army played important roles in "The Great Mutiny." REBEL QUEEN was just a wonderful book for so many reasons. First and foremost, I absolutely loved Sita and I was so glad that she was the narrator of the story. Sita was a wonderful character and it was so interesting to see India and its history through her eyes. Her voice seemed authentic and her honestly about everything that happened to her was refreshing. Her words were almost conversational in tone and it truly felt like she was telling me her story. In addition, I loved learning about this piece of India's history. I can honestly say that I know next to nothing about India, and you know how I like to get my "history lessons" through historical fiction. Thankfully, Ms. Moran is willing to thoroughly research historical events and characters and use her storytelling skills to share her knowledge with her readers. I was fascinated by what occurred all over India, and especially in Jhansi, in the mid nineteenth century; and it does go to show that truth can be stranger than fiction! Ms. Moran definitely has a talent with bringing a time period and a country to life. It's pretty obvious that she can create an intriguing story with interesting characters by building on some pretty amazing real-life events; however, it's sometimes the small things that make her writing so special. By that, I mean that I appreciate the little details that she adds to her stories liked her descriptions of the food and the clothes and even the traditions of the culture. And finally, I just loved the story of Queen Lakshmi. It is truly a special one and such a wonderful part of India's history. While I'm certain that the author knows how to weave a story, I think credit should be given for bringing this story to light for readers like me... ones who know next to nothing about India's past. Queen Lakshmi was an amazing woman and so strong and determined. Her story and the story of her female army is just incredible and one that should be shared -- we can all use a little more girl power stories, right? REBEL QUEEN would make an excellent book club selection. My group has discussed one of Ms. Moran's novels and even had her call into our meeting, and it was a lot of fun! There is a reading guide available with twelve thought-provoking questions as well as some suggestions for ways to enhance your meeting. Some of the themes you might want to explore include colonization, victimization, parent/child relationships, grief, loss, sacrifice, poverty, war, strength, courage, and love. 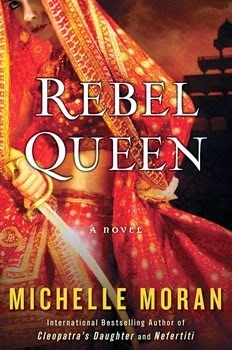 I adored REBEL QUEEN and highly recommend it to fans of historical fiction! This sounds like a fantastic book! It's been on my TBR list, but I may just need to move it up! I love Michelle Moran's work :D Great review! I can't wait to get to this one. So glad to hear that it is as good as I hoped. I love reading books about India - it has such a fascinating culture. Sounds like this one needs to go on my TBR list for sure.